Marine recirculating aquaculture system (MRAS) is an effective technology that provides sustainable farming of food fish globally. However, dissolved organics material (chemical oxygen demand, COD) and especially ammonia are produced from uneaten feed and metabolic wastes of fish. To purify the MRAS water, this study adopted a sequencing biofilm batch reactor (SBBR) and comparatively investigated the performances of four different carriers on ammonia and COD removal. Results indicated that the NH4+-N removal rates were 0.045 ± 0.05, 0.065 ± 0.008, 0.089 ± 0.005, and 0.093 ± 0.003 kg/(m3·d), and the COD removal rates were 0.019 ± 0.010, 0.213 ± 0.010, 0.255 ± 0.015, and 0.322 ± 0.010 kg/(m3·d) in the SBBRs packed with porous plastic, bamboo ring, maifan stone, and ceramsite carriers, respectively. Among the four carriers, ceramsite exhibited the best performance for both NH4+-N (80%) and COD (33%) removal after the SBBR reached the steady-state operation conditions. For all carriers studied, the NH4+-N removal kinetics could be well simulated by the first-order model, and the NH4+-N and COD removal rates were logarithmically correlated with the carrier’s specific surface area. Due to its high ammonia removal, stable performance and easy operation, the ceramsite-packed SBBR is feasible for MRAS water treatment. The online version of this article ( https://doi.org/10.1007/s11356-019-04887-8) contains supplementary material, which is available to authorized users. 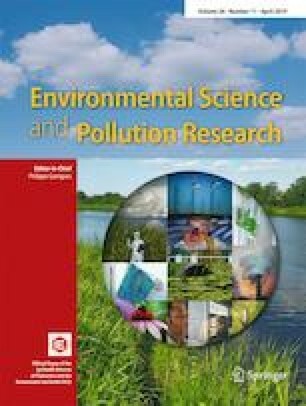 This study was financially supported by the National Natural Science Foundation of China (51878362), China Postdoctoral Science Foundation (2017M610410, 2018 T110665), and State Key Joint Laboratory of Environment Simulation and Pollution Control (Research Center for Eco-environmental Sciences, Chinese Academy of Sciences) (18K02ESPCR). • Ceramsite exhibited the best performance for NH4+-N (80%) and COD (33%) removal. • Removal rate was logarithmically correlated with carrier’s specific surface area. • NH4+-N removal kinetics could be well simulated by the first-order model. • Pollutant removal performance was not positively correlated with reactor height. • The ceramsite-packed SBBR is feasible for MRAS water treatment.